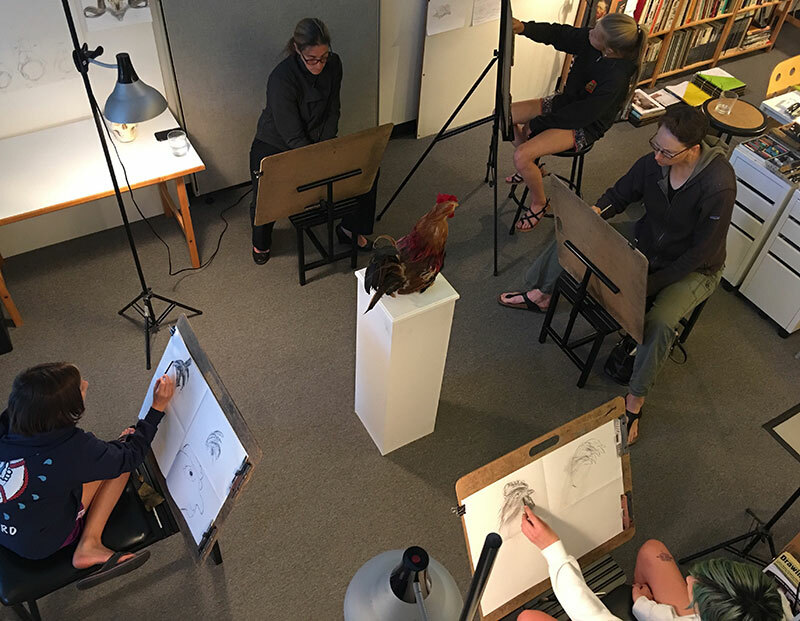 “Yes,” answered the rooster, a stoic creature of few words, precariously balanced on the studio pedestal. 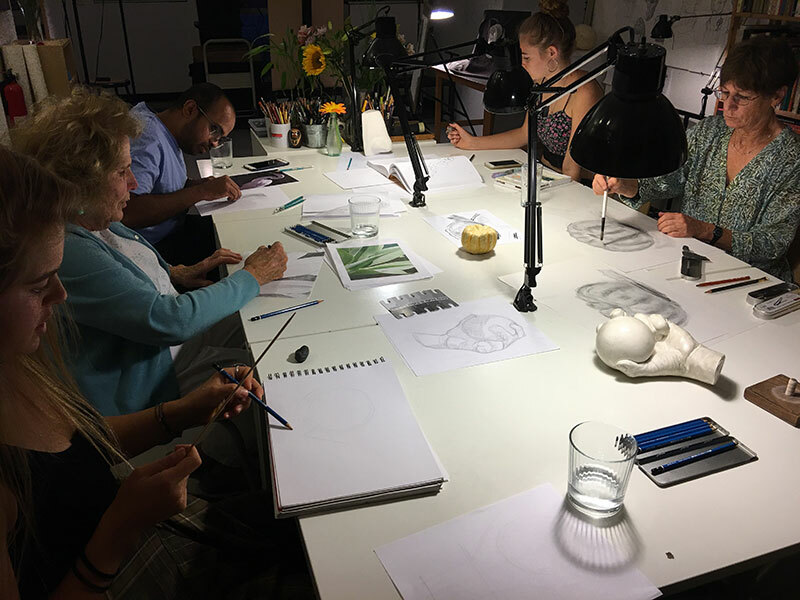 But Thursday’s Drawing Lab students had a different answer. I enjoy setting up the rooster challenge for unsuspecting students. It is amusing to see their curious, somewhat hesitant expressions as they sit face to face with the rooster. But hesitation quickly turns to concentration as students begin their initial measurements. 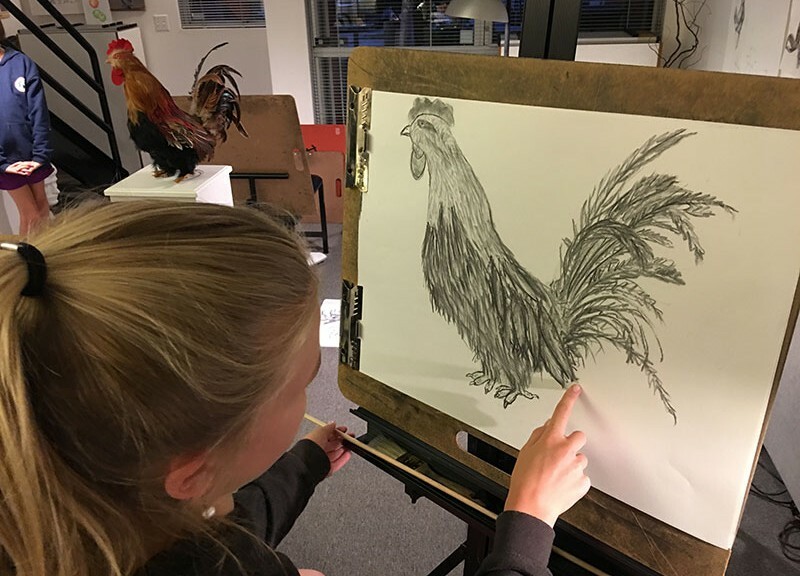 Adult student, Rachel, brought the papier-mache rooster to life with superb contour and gesture lines that suggest realistic character and movement. We started last week’s session with short poses. 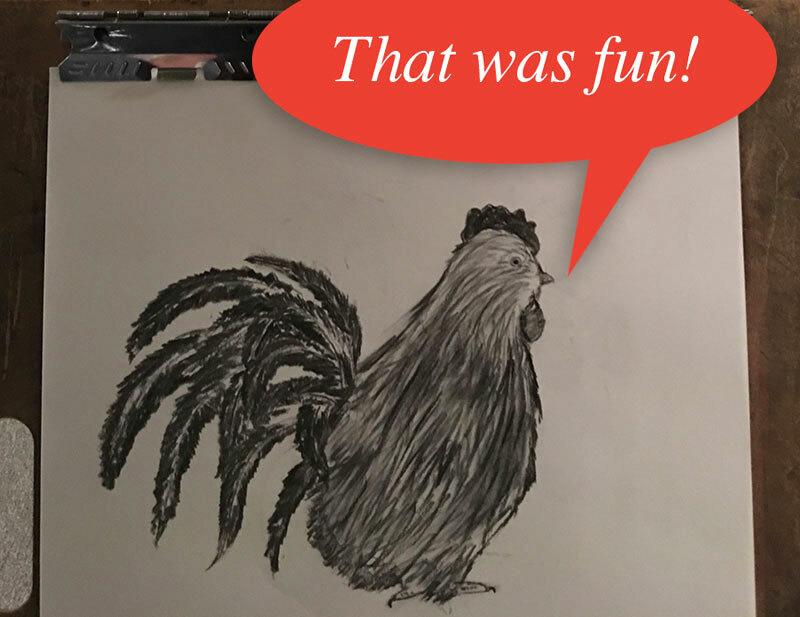 After each timed pose, the rooster made a quarter turn—he is very well trained. 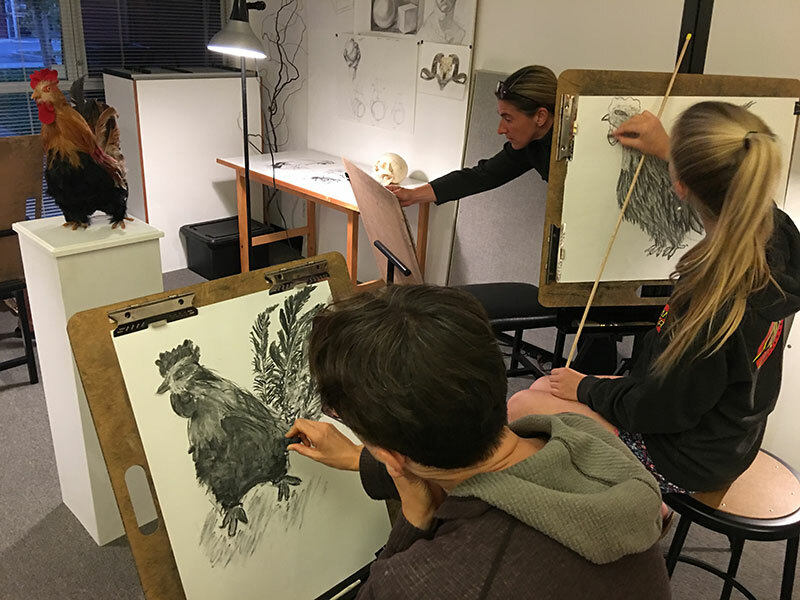 Students did four zoom-in views of different areas of its body. Rachel’s awesome charcoal take during the evening’s long pose. In the background is Amma at work. We finished the evening with a long pose. 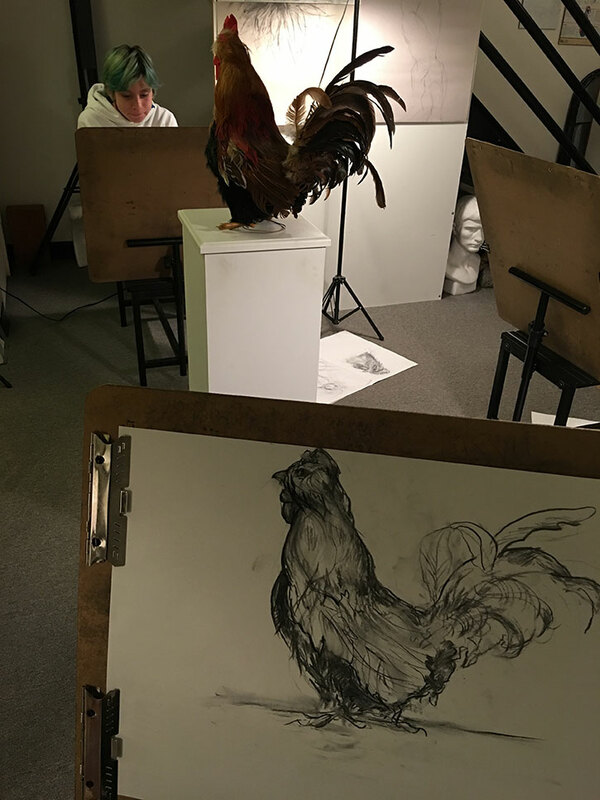 As students studied details and practiced techniques, they realized that when it comes to improving their skills, it pays to wake up with the roosters. 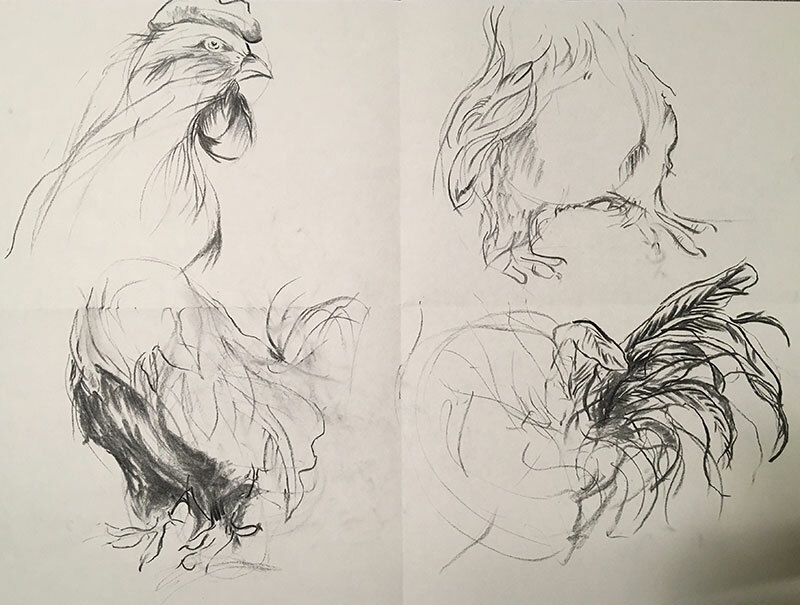 Above left is Amma’s richly layered capture of the rooster’s long pose; to the right is her cool little zoom-in study. 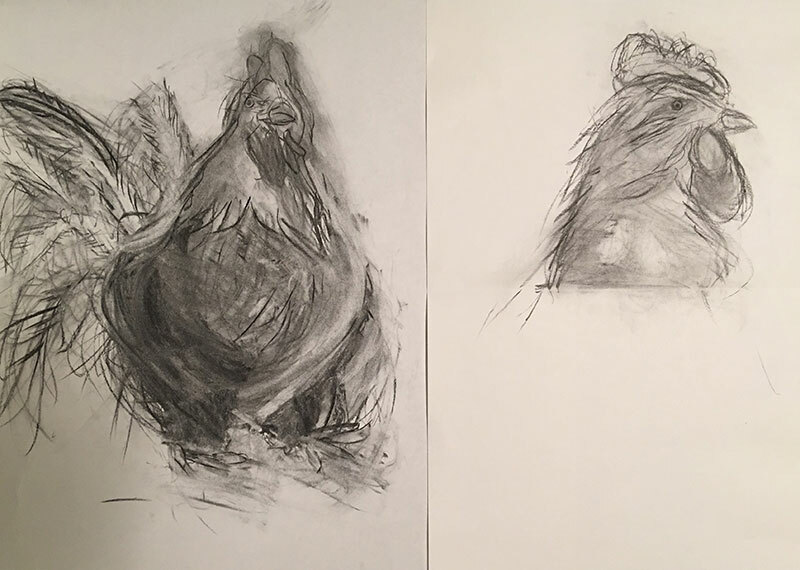 Deep in the rooster drawing zone, these sketchers are definitely not chicken. Scout’s beautifully detailed study of subtle, feathered textures. 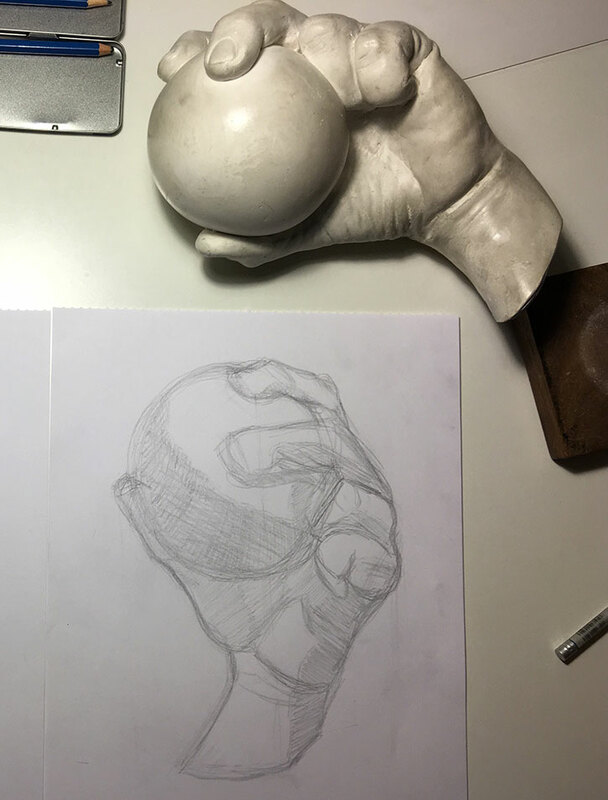 Morgan’s amazingly accurate block and sketch study. 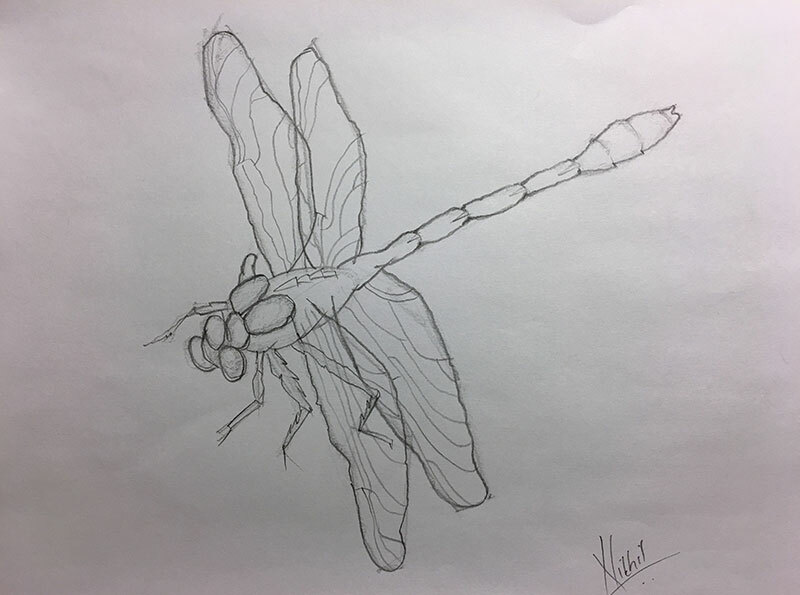 Nikhil’s beautifully detailed drawing of a dragonfly’s form and contour edges. 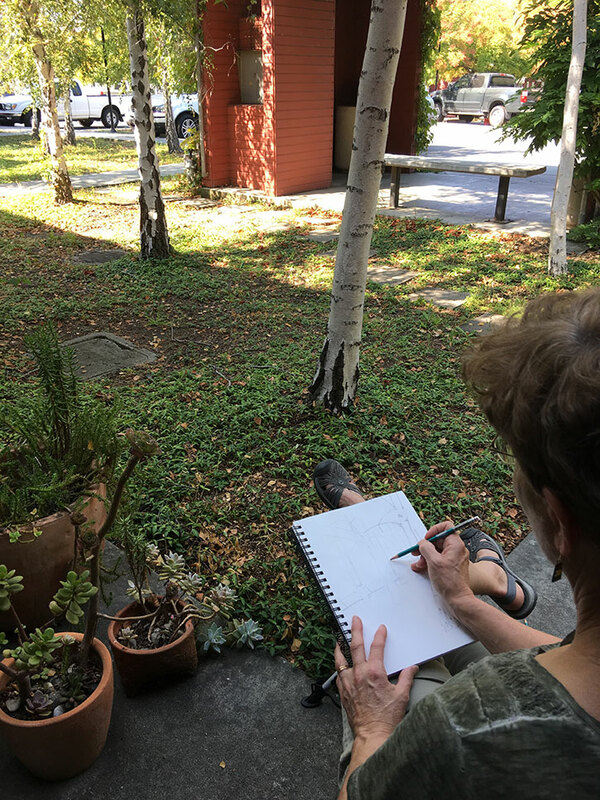 Lori took her private session outdoors in preparation for an upcoming road trip. 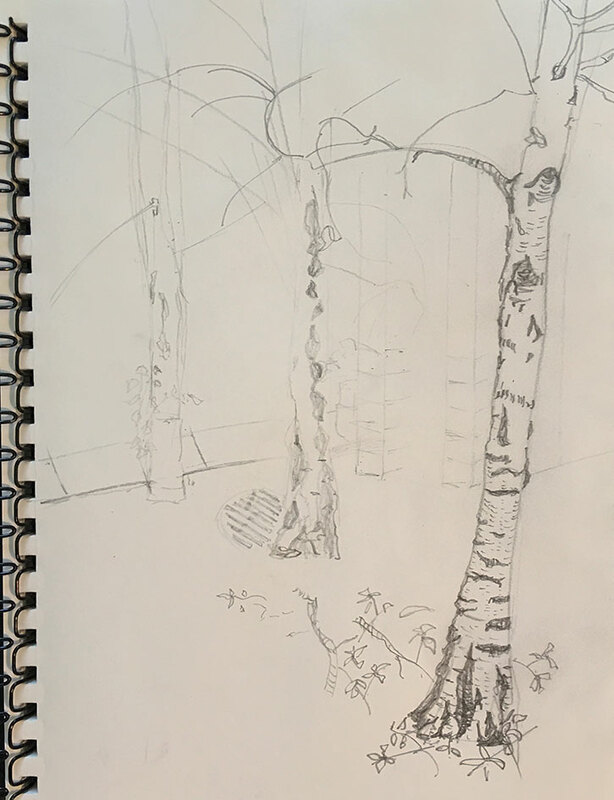 Lori’s study of line emphasis, texture, and composition. Feature Image at Top of Page: Laurel puts the finishing touches on her impressive impression of the rooster.